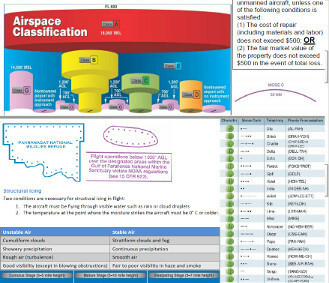 Interested in finding some practice FAA Part 107 test questions to help study? This article will discuss the 65 sample Part 107 knowledge test questions based upon my knowledge as a practicing aviation attorney and current FAA certificated flight instructor. The Part 107 initial knowledge exam will be 60 questions and you will have 120 minutes to complete it. The minimum passing score is 70% which is a maximum of 18 questions wrong or a minimum of 42 questions right. The Part 107 recurrent knowledge exam has 40 questions. You have 80 minutes to complete the exam. You need 70% to pass. Both the initial and the recurrent quizzes are below. You should have already studied Part 107. If you have not, I created free 100+ page Part 107 test study guide. The study guide has the material the FAA suggested you study, but I added essential material they left out. It also include 5 “cram” summary pages of the test material. It also comes with 65 sample Part 107 exam questions that are answered and explained. You should take the practice quiz that I have below. At the end of the quiz it will give you a breakdown of what areas of the quiz you need to study. For the areas you are deficient, you should study the subject based upon the ACS code listed. Here is an article I did on the ACS. 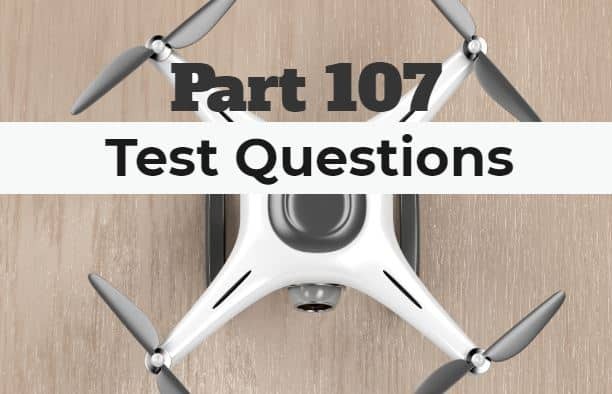 Once you feel you have mastered these questions, move on to Part 107 Test Questions for Remote Pilot Knowledge Test (my super insanely hard 22 questions page) which I created to help people really dig super deep. If you sign up for my drone law newsletter, you’ll receive the PDF of the entire 65 questions answered and explained. This practice test has 60 questions. These 60 questions were created by the Federal Aviation Administration. At the end you’ll be given a score with a complete breakdown of each of the 5 subject areas. Sky 7000 feet overcast, visibility 1-1/2SM, heavy rain. Sky 700 feet overcast, visibility 1-1/2SM, rain. Sky 700 feet overcast, visibility 11, occasionally 2SM, with rain. Wrong. Sky 700 feet overcast, visibility 11, occasionally 2SM, with rain. [Clever. Really clever. Looking at the other material, like LAX above which shows 6SM, that should have clued you in that the value for that place should be a number in statute miles. 180° true at 4 knots. 180° magnetic at 4 knots. 040° true at 18 knots. Wrong. 180° magnetic at 4 knots. Wrong. 040° true at 18 knots. Wrong. Propeller efficiency is increased. Wrong. Density altitude does not affect propeller efficiency. Good visibility and steady precipitation. Poor visibility and intermittent precipitation. Poor visibility and steady precipitation. Wrong. Good visibility and steady precipitation. [It would be poor visibility]. Pilot's Operating Handbook or UAS Flight Manual. exceeds maximum allowable operating weight. exceeds its critical angle of attack. the gross weight is reduced. the CG is shifted rearward to the aft CG limit. Correct. the airplane is subjected to maneuvers other than straight and level flight. [Explanation: In a turn of 30 degrees of bank and while maintaining level flight (no altitude loss because you slightly pitched up), you will have a 1.154 load factor. This means that in this turn you will be feeling like you are pulling 1.154 G’s. 33 pounds x 1.154 = 38.082 pounds]. Wrong. The aircraft is South. Wrong. The aircraft is West. Correct. 122.8 MHz. [This is the CTAF]. Wrong. 135.075 MHz. [This is the AWOS, not the CTAF. You can check out the airport weather on this frequency. Would also be great to find out what the surface winds are blowing at that location.]. the Notices to Airmen (NOTAM) publication. notes on the border of the chart. Wrong. notes on the border of the chart. Wrong. the Notices to Airmen (NOTAM) publication. Wrong. High density military operations in the vicinity. UAS does not need a required maintenance schedule. When the manufacturer does not provide a maintenance schedule. When the FAA requires you to, following an accident. The operator should establish a scheduled maintenance protocol. The operator should contact the FAA for a minimum equipment list. 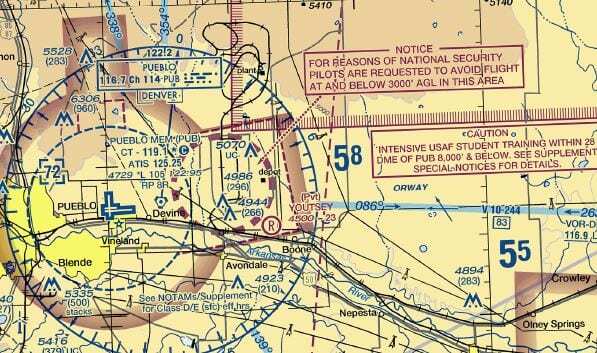 The operator should contact the NTSB for component failure rates for their specific sUAS. owner of the small UAS. You Failed. You need at least 42 to pass!